The film Week End, by Godard, falls into a category of art I would also include such works of art as Rauschenberg’s combines. It is an assemblage of events or items, although seemingly utterly disconnected and random, each part actually works together to form a greater meaning as a social commentary. Week End is a Rauschenberg’s Combine because of the way the movie is assembled. Each part of a combine is an already existing entity, with its own context, meaning, and allusion. That singular part is then radically changed by being placed in a new context and used in a way it was never intended. These parts make a whole without making a direct focus. 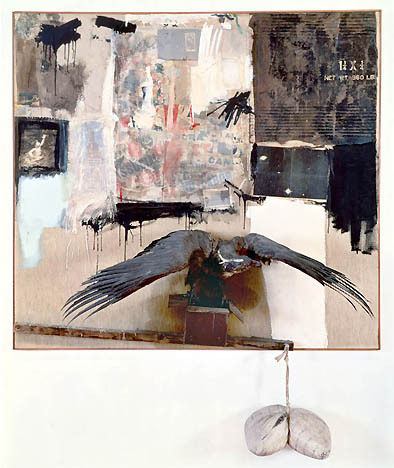 Rarely in Rauschenberg’s combines is one particular item the center of the viewer’s attention while the other parts are subject to its hierarchy. Instead the parts are assembled to make one lose focus of any singular item. As a collective, a social commentary can be derived based on a juxtaposition of the combine’s pieces. Hence the interest of these projects lies in the tension of the elements instead an allegorical hierarchy. This relates back to the Week End’s ‘story line’. Seemingly random events are strung together by this bourgeois couple floating through the story like the eagle in Rauschenberg’s ‘Canyon’. Each of the events- the car crash, the philosopher couple, the singing man in the telephone booth, or the African revolutionary narrative- act as the paint, photography, found object, or newspaper used in any number of Rauschenberg’s combines. Each becomes aloofly strung together, and collide as forced together programs. Together, with the focus lost on a singular event, the whole tells the meaning. It reveals Marxist leanings and a commentary on the upper class’s internal preoccupation onto worldly problems. There is a specific language used to interpret either work, one not of hierarchy or direct translation, but of an optical structure- a reinterpretation of spectatorship. These works speak loudly of Robert Venturi’s Complexity and Contradiction in Architecture. Here Venturi promotes a collision of programming. Programming that is complex and ironic, paradoxical and dramatic, through a lack of simplistic order. This order is so complex because it lacks singular focus, and instead creates foci. Ultimately, this promotes a richness of meaning over an overt clarity of meaning. I don’t think a statement embodies Godard’s Week End or Rauschenberg’s combines more. Each item of Rauschenberg’s combine is a separate piece of program that collides with its neighbors, giving the overall piece complexity and more intricate level of meaning than any singular item could have on its own. The same is true of Godard’s work. Each event the couple experiences is like a rouge program crashing into the next in its sequence. These incidences create a complexity of meaning that would elude any one situation shown. These works of cinematic and fine art prove Venturi’s theories span well over more than just architecture. This ideology is the structural system through which we can perceive.